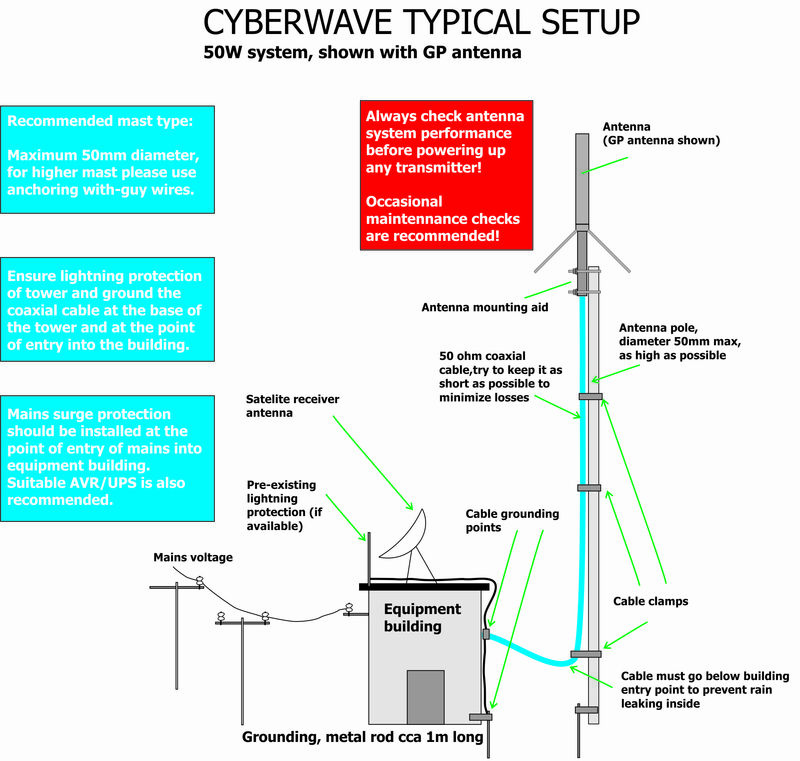 CYBERWAVE FM - WITH SUPPORT FOR SOLAR POWER AND SATELLITE AUDIO! This package is based on our compact 50W CYBERWAVE FM+ transmitter for budget-concious broadcasters, operating from 87.5 to 108 MHz. This is a small, but well built and reliable package with DSP stereo and RDS, antenna with coaxial cable, optional mains power supply or solar power supply, satellite receiver (without standard satellite dish which you can order locally). This package can also be powered from a car battery (13.8V-15V). 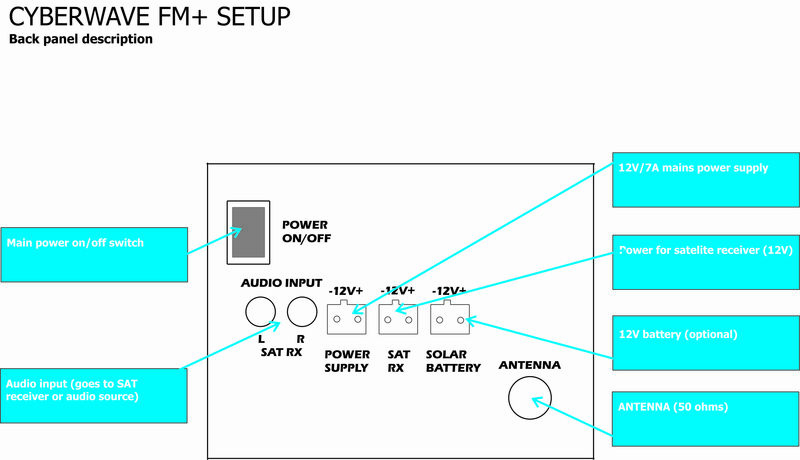 Several power sources can be connected at the same time, transmitter will automatically switch between them to ensure 24/7 signal. Excellent for re-transmission of audio from satellite radio stations. A perfect backup transmitter for a large radio station, main transmitter for a small community/village radio, church radio or educational radio. Very suitable for portable or improvized installations and small radio stations in Africa and other remote installations, advertising (housing, shops), special occasions, drive-in cinema wireless sound distribution, translation, tourism.... . Protected with Temp and SWR protection. . It is never easy to predict range. 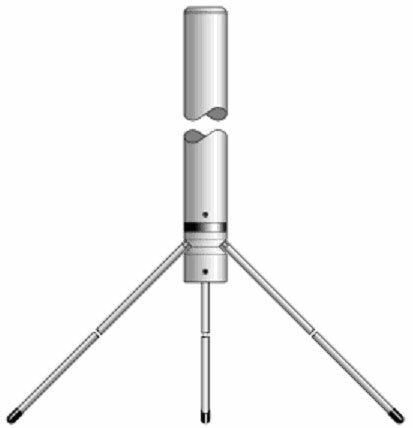 You can expect from 3km to about 30Km depending on power, antenna and location. More in very good conditions. This depends a lot on terrain configuration, type of antenna and especially the location of the antenna, coaxial cable quality and length and of course quality of receivers. 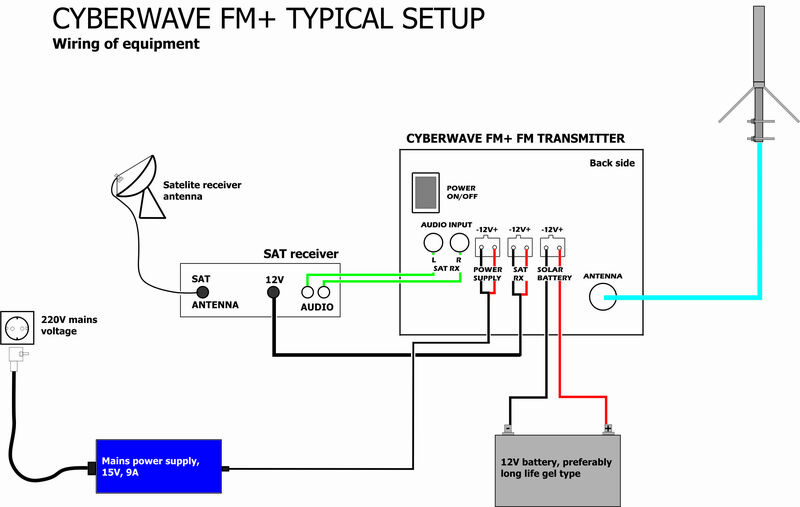 - CyberWave 50W FM transmitter (STMAX3050 in enclosure with fan). OPTIONAL ITEMS: WHAT IS MAINS POWER SUPPLY? - Transmitter runs off 15V @ 7A max for 50W transmitter. If you don't already own one you can buy ours. It runs off 110V to 240V. The mains cable for this is the same as used for PC and is not included (every country uses different plug). It is simply plugged into mains power supply and wall socket. 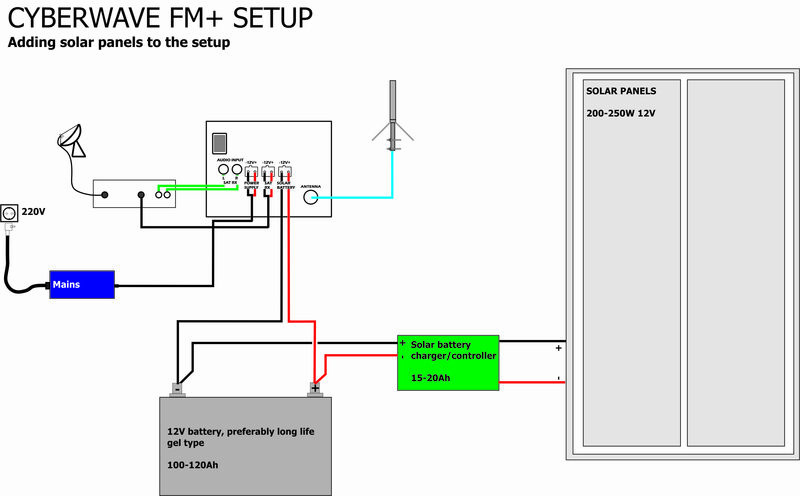 OPTIONAL ITEMS: WHAT IS SOLAR POWER SYSTEM? - You can add inverter if you want to also run a PC or something else from this setup, but ensure that panel and battery will support all loads. - We recommend that you order this locally, even in Africa there are usually cheap solar solutions available. Due to size and weight shipping such systems worldwide is very expensive. CAN I POWER IT FROM MY CAR? Yes, you can use car battery of course or power via cigarette lighter plug. Radio Data System, basically it displays station name and sometimes song name and similar information on a compatible radio receiver. Very popular in Europe, less so in the US. Can be set from the LCD display! - Power supply (if you get ours) requires mains cable which can be purchased in your country (each country has a different mains plug and we don't carry all). This is standard cable used in your PC for example and its price is typically around 1 US$ or less. You can get it in any electronics store, such as radio shack, circuit city, any computer store etc.